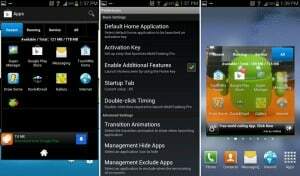 Multitasking is one of the best features that Android is offering to its users. There are many applications that can help you with this, such as Task Managers, Task switchers and others. We all experienced a situation when we need to stop what are we doing on our mobile phone for another action but we don’t want to lose our progress. There are a few tips for you below. The back button is available on all the Android devices and most of us have never used it for multitasking purposes. While we tend to go to the homescreen, then the App drawer and then pull out the app we need, the back button can be used to do this quickly if you want to go back to the previous app you were working on. All android devices have an back button which can be used to go to the application used previous. Most people don’t know that the back button let you do this. You simply need to tap the button and you will be back to the application used previous. Remember that if your application has multiple pages or menus, you will need to tap the back button until you get to the home of the application. Another very good tip is to create shortcuts on the home screen and you can do that using Launcher Pro app or Go Launcher. If you press long the home button you can access your recently used apps very easy. You will simply choose the applications from a small box. Play Store offers you another good option for this kind of problem. Quickdesk is a very good application that uses an interface when the home button is double tapped. You can customize the settings and put your applications in which order you use the most. The Smart Taskbar application is also a very good solution for you as you may not find your favorite applications on the home screen or recent list of applications. This is a very good app because you can customize is 100%. It is very easy to use and you will find it into the Play Store. The hyperspace jump application is also a good way for multitasking because you can easily create shortcuts. You can choose to customize the 12 grid layout and add the applications you like the most. You only need to swipe to bring the application up. The SmartBar application is one of the best because it is a task manager, quick launcher and task killer all in one. You can do almost anything you want with it. You can Install or Uninstall apps, backup them, switch between apps and other more. You can also know about your battery status and set a quick toggle area for your own options for Connectivity, Auto Rotate etc. You can download it from the Google Play Store if you want your phone offer you the best experience. There are many options and applications for multitasking and all you have to do is to choose the best one for you.